You don’t find hotels with grounds this big anymore. Certainly not in Hawaii. 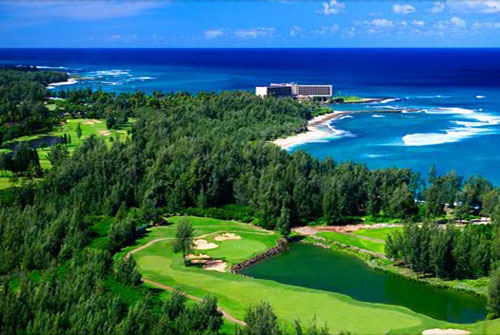 Turtle Bay Resort, the luxurious property where Jason Segel set his hit movie “Forgetting Sarah Marshall,” is an 880-acre paradise, standing alone on the very northern tip of Oahu. When it was built in 1972, development was focused on Honolulu and Waikiki, about an hour away, so its owners scored a chunk of beautiful not easy to come by these days. With twin beaches, as different as coal and diamonds, Turtle Bay is the perfect hideaway for such Hollywood types as Charlie Sheen, Morgan Freeman, Minnie Driver, Dennis Quaid, Carrie Underwood and Owen Wilson, whether they’re filming a movie there or not. Located in the country, out where roadside shrimp trucks sells sweet, local corn and plump, succulent shrimp, Turtle Bay has 375 recently-renovated rooms and 42 luxury beach cottages with Brazilian walnut floors, 15-foot ceilings and deep soak tubs. All that’s between you and the sand is a fringe of sea oats. Not only is it near Sunset Beach and Waimea Bay, both big time surfer hangs, but Turtle Bay Resort talked pro surfer Hans Hedemann into calling the shots at their premier surf school. Luckily for beginners, the lessons take place in the calmer waters of Kawela Bay where turtles are more common than swells. As for Sarah Marshall, Segel hired Kahu spiritualist Auntie Netty to bless the 33-day production. And it worked. All 33 days had perfect idyllic conditions. Find out more about Turtle Bay and its five miles of coastline here.